The last few weeks before camp opens are hectic for anyone working on maintenance and facility projects. What seemed like plenty of time in the fall has now become a mad dash to be ready for the first-session campers. Some items have to be ready, like patching holes in screens and replacing toilet parts. But some would be better if you didn’t do them. 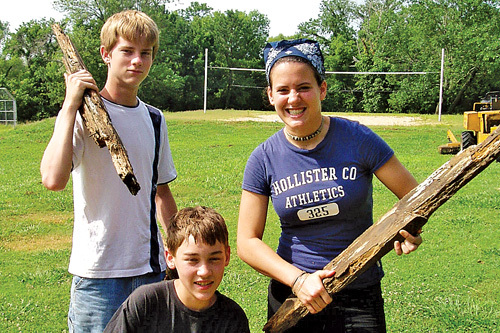 Many camps have volunteer weekends in the spring to “open up” for the season, or accomplish a special project or two. And every time I mention this to a group of camp property managers, I hear several snickers. “I hate those volunteer events,” one says. “It takes me longer to get ready for them and clean up after them than it would just to do it myself,” another adds. So I share an example of a group of two-dozen camp moms (and some grandmothers) who get together the second week of May each year to plant seeds and flowers at Camp Takodah in New Hampshire. By summer, there are mounds of color in front of every building in camp. The director invites at least one of the volunteers to be present at each check-in day, as so many parents comment on how beautiful and well-cared-for the camp looks. He asks the parents, “Please go thank Emily Jones over there. She and her group of volunteers do the plantings!” As a result, Emily* obtains new volunteers for her group, and new donations of perennials at every check-out day. Nice. Yet the ­real story begins the following winter when a parent sees one of these volunteers at the PTA or in the grocery store, and says, “I just don’t know what to do with my kids this summer,” and every flower-planting volunteer responds, “Oh, you have to send them to our camp!” Yes, camp-maintenance director, you can plant the flowers yourself. But there’s no way you can sell so many new parents on filling a camp with their kids. And those new campers will pay for the tools and materials and staff that you’ve always wanted. The more volunteers, the more meaningful the projects, the more enthusiastic salespeople they become. They’re part of your family. For a kid (and the kid in all of us), using tools is fun. Building useful stuff is fun. Working together on a project builds friendships and lifelong memories. Learning new skills builds confidence and the courage to try new things. And doing all this with a caring adult gives kids a sense of worth and strength of character. Don’t build those new picnic tables in May; just cut the pieces out and wait until summer when you can offer it as an activity. For one hour a day, spend time with a group of kids. Is there anything more valuable you could be doing? Let’s look at some examples. I chose picnic tables first because every camp needs more--more places for kids to slow down and sit and talk about what they’ve been doing, to “set” the memories while creating friendships. We need to eat outside more often, facing each other more often, hanging out outside the cabin instead of inside, imagining a fort or a boat or a carnival booth, climbing on and jumping off. This project entails big hunks of wood, and you can use hammers and screw guns and socket wrenches to put them together. Kids learn how to measure, use a square, and work together. And when it’s done, they can use it and show it off to everyone (including Mom and Dad). Many of them will grow up to build one with their own kids someday. Talk about your long-term effects of camp! And those campers’ moms and dads will be more impressed that their kids are showing off “their” picnic table than they ever would have been seeing that table on opening day. I guarantee it. Like picnic tables, no camp has enough benches. They are needed for campfires or gathering spots, for watching or waiting, and, most importantly, for talking. Solid, long-lasting benches can be as simple as a 2-inch by 10-foot board stretched across a couple of 6-inch by 6-inch boards. But something with a back on it is so much more satisfying (to sit in, and to build). One of my favorite designs is by Aldo Leopold, the famous author of A Sand County Almanac. He designed a simple bench so people could sit and watch birds and beautiful views. I like it because it’s clever, and can be used almost anywhere from cabin porches to archery ranges. And kids love to bolt them together (see photo). The plans are available online by Googling “Leopold Bench.” I alter them slightly by using 2-inch by 6-footers for the legs and 5-foot long 2-inch by 10-inch boards for the seats (wide enough for two people). And if you use two 5/4 by 6-inch deck boards for the seat back, it looks even more comfortable. This is another example of something that’s fun to have and play, but far more useful in child development if kids and counselors help build it. Frame them with 2-foot by 6-foot sides and 2-foot x 2-foot nailing ledgers under the plywood “floors.” Everything is glued and screwed, so it will hold up being assembled and disassembled a lot. Handholds are cut into the sides to make them easier to lift and carry. The sections are all 3 feet wide (4 feet would be nicer, but much heavier and harder to store.) Each piece is not more than 6 feet long, so none are too heavy to carry, and can fit easily in a mini-van for promotional events, like school fairs. (Combined, some holes are up to12 feet long. Some are “dog-legs” left and right, and some are just off-set to create a jog.) Pieces join with standard door hinges, with bent 18D nails as pins (easier to pull out). The carpet is standard indoor-outdoor green olefin, glued down. “Water” traps are merely blue carpet recessed 1/2 inch. “Sand” bunkers are plywood, beveled at the edges, painted with tan paint, and sprinkled with sand while wet. The obstacles can be as simple as blocks of wood or removable camp “landmarks,” like logs, rocks, drain pipe or small “cabins” with an in-door and out-door. Arts-and-crafts classes can work on some of these, too. One of my son’s favorite projects as a 10-year-old was helping the “construction crew” class, led by our property manager, to build a floating platform. The dock floats came from the local lumberyard, and the rest was just pressure-treated wood. When it was finished, the names of all the “workers” were routed into a side-board for posterity. Ten years later, those kids still talk about building it. This was one of my favorites! I visited YMCA Camp Northwoods in New Hampshire, and loved the small playground in the village of youngest campers. They could play within sight of their cabins, so counselors let them gather there frequently. At YMCA Camp Belknap (N.H.), I fell in love with the small “council rings” in each village, complete with a stage for nightly unit campfires. Why not combine the two? We started with a few rows of benches in an arch, facing a stage about 6 feet deep and 12 feet wide. On each side there was a “fort” tower with platforms at 6 feet high with 5/4- x 6-inch deck boards for sides, and pointed on top to look like log fort walls. Each of these “blockhouses” had a way for campers to climb up inside and outside--ladders, ropes, a slide … normal playground stuff but keeping with the “fort” theme. Finally, we included a bridge between the two towers that acted as the backdrop for the stage. The kids worked on it for several weeks, and when finished it became a kid magnet. It was great fun for climbing on and make-believe while waiting for counselors; it was a wonderful stage for evening campfires, where skits could include people in the towers and popping out of windows! Kids love being on stage, and not enough camps have them at their all-camp gathering spots. Skit nights are more special, song leaders are easier to see, and campers will go out of their way to hang out there. Eight feet deep and 24 feet long makes a stage big enough for most any skit, and by adding three rows of “steps” along the front, you have built-in risers for an entire unit to sing a song or do a cheer. At YMCA Camps Beckett and Chimney Corners (Mass. ), the teen programs that sell out first each year are the “Construction Cabins.” Each group has a skilled carpenter who works with the campers eight hours a day, so the teens learn how to use all the tools and even cut their own boards. Some of the most dedicated alumni come from these groups because the friendships they make while doing meaningful work are so strong, and every time they return to camp, the first visit has to be to “their” cabin. There are times when many of us in camping forget that the goal is to develop great kids, not just to entertain them. We’re not running a theme park. But having them help build a theme park, now that has some real possibilities! Gary Forster recently retired from a full career in organized camping. He still speaks at conferences and volunteers. Reach him at gary@garyforster.com.